^ Rojek, Wojciech (2004). "Chapter 4: The government of the Republic of Poland in exile, 1945–92". In Stachura, Peter D. (ed.). The Poles in Britain 1940–2000: from betrayal to assimilation. London: Frank Cass. p. 33. ISBN 978-0-7146-5562-8. ^ Simons, William B. (1980). 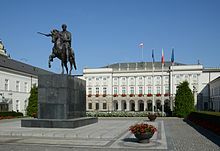 "Constitution of the Polish People's Republic". In Simons, William B. (ed.). The Constitutions of the Communist World. Alphen ann den Rijn, the Netherlands: Sijthoff & Noordhoff. pp. 288–310. ISBN 978-90-286-0070-6.